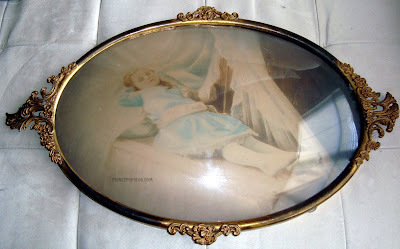 Previously, I featured a photograph of a deceased gentlemen in convex/bubble glass and frame. This example of post-mortem photography mirrors the previous gentlemen in presentation, but this time it's a young girl of maybe five or six years old. 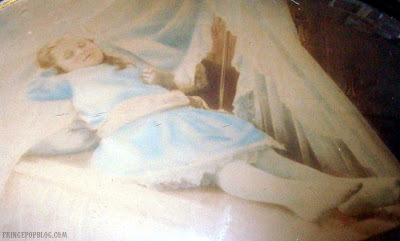 The girl looks almost as if she is sleeping and, in fact, children were often posed that way to make them look more alive. 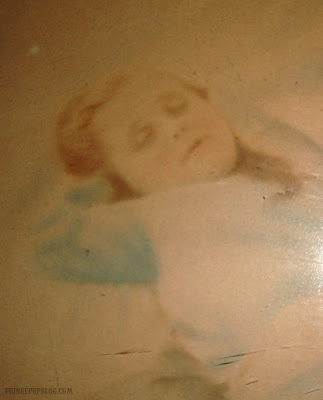 In 1990, the Stanley Burns Archive released a book on post-mortem photography called "Sleeping Beauty," whose title evokes the manner of pose. I find this photo both artistically beauitful and substantively unsettling.